The last time I got to go this nuts at a dance show was like… NEVER! 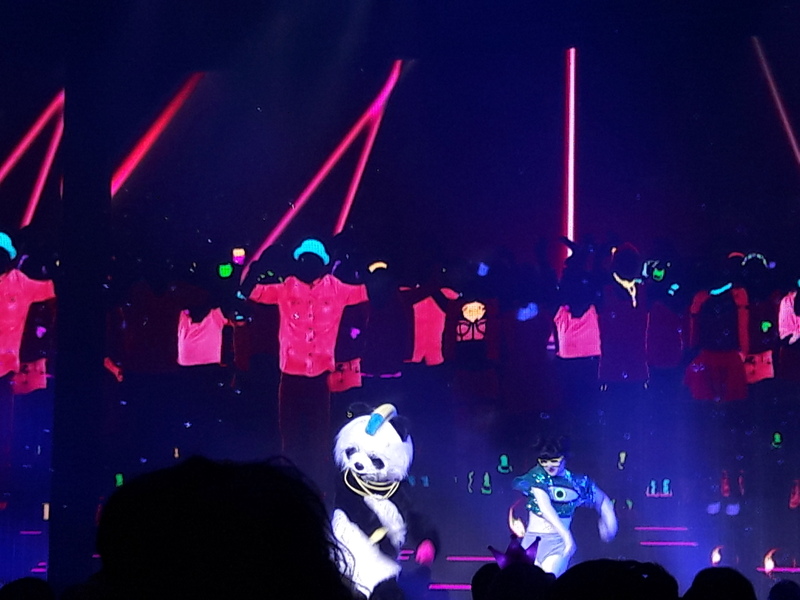 Ubisoft opened its first live Los Angeles entertainment experience with its pilot tour of JUST DANCE LIVE, at the Hollywood Palladium on Thursday evening – an immersive and interactive show, based on the #1 music video game franchise of all time. We (kids of all shapes, sizes…and ages!) selfied on the red carpet, mingled with colorful costume characters and pre-show hobnobbed with JUST DANCE LIVE dancers. We got Splat Hair rainbow-colored and blink-light lit faces glittered in the ‘Get Ready For It’ zone; ate pizza, pop corn & pretzels and even got to cartoon ourselves on screen during the pre-live stage dance contest, all before entering the super high energy, surround sound and dance spectacular of unending fun that also included a team sing-along. It was awesome! Gia On The Move posted some live coverage on our Instagram account. Check it out! The tour has played Miami Beach, Chicago and Houston; it completes at the Hollywood Palladium in Los Angeles (March 29-31). “Expanding the 2D world of the video games in to a vivid 3D universe, JUST DANCE LIVE celebrates the characters, costumes, moves and music that more than 120 million global Just Dancers know and love, while providing an exciting new escape for fun seekers of all ages. We are thrilled to include a wide range of amazing, high energy songs from the Just Dance game in the live production. Participants will have a blast at JUST DANCE LIVE, following the iconic moves of the JUST DANCE choreography performed by our cast of 16 incredible dancers.” said Hinde Daoui, Live Entertainment producer, Ubisoft.